COVER: Here is everything you need to know! How the game is played; how to play to win; setting up; key moves; strategy and skill; scoring and rules; the part luck plays; instructive examples; doubling ... chouette. All explained in nontechnical terms with diagrams and illustrations. 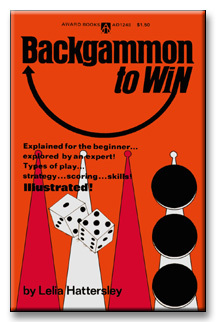 Backgammon to Win includes such game winning information as: eye training and coordination; progress, protection and position; opening moves; the running game; the back game; odds against hitting a blot; entering from the bar; bearing off.